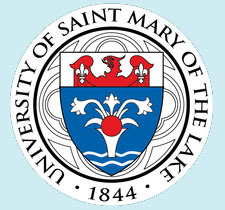 The conference center at the University of St Mary of the Lake (USML). The moment you enter the gateway to the 800-acre campus, the peaceful natural surroundings create a perfect environment for cultivating the riches of our faith. Take a walk through the woods, or along the three-mile road circling our 100 acre St. Mary’s Lake. Or simply enjoy the quiet serenity of this beautiful setting. The conference center offers you and the group the opportunity to relax, reflect and renew. USML’s professional conference service team will care for the group’s every need. The food is superb, prepared by as friendly staff that’s happy to satisfy special requests. Every guest is guaranteed a spacious, spotless double room with a private bath – plus a view of the beautiful colonial university campus, the unspoiled woods of St. Mary’s Lake. Communication facilities are available for your needs. Enjoy the indoor swimming pool as well as basketball, volleyball, racquetball and tennis courts. A three-mile road circles the lake – perfect for walking or jogging. The university campus includes an 18-hole golf course. Tea, coffee breaks and evening socials will be tailored to the group’s needs and schedule. Single Occupancy: Fee: $350,room & board 5 days:$520; Total: $870. Single Occupancy:$104 per Day Includes: Sleeping Room-One Person per Room, Breakfast, Lunch & Dinner. Double Occupancy:$93 per Day Includes: Sleeping Room-Two Persons per Room, Breakfast, Lunch & Dinner. Sleeping Room Includes: Two twin beds, Private bathroom, a dresser and desk, towels, free WIFI and access to the Conference Center Living Room which houses 2 computers and printers, and a 24-hour complimentary beverage bar which has coffee, tea,soda and water available. In no time at all every day stresses begin to melt away. You feel refreshed beneath the clear sky at night and amid the stately pines and ancient oaks during the day.